WASHINGTON — The head of NASA downplayed the looming threat of mandatory federal spending cuts and said the U.S. space agency's budgeting plans do not account for the possibility that its top line could be sharply reduced in years when NASA will be scrambling to fund major science and exploration programs. 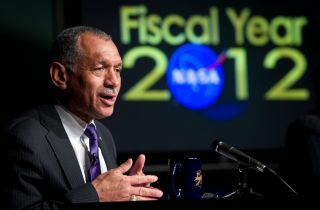 "We are not planning for sequestration, we are not budgeting for sequestration," NASA Administrator Charles Bolden said here Dec. 5 at a lunch hosted by the Space Transportation Association, an advocacy group based in University Park, Md. "I don't talk about sequestration because I don't think it's going to happen." Sequestration refers to the nearly $1 trillion in spending cuts that would take effect starting in 2013. The cuts were triggered by the failure of a bipartisan panel of House and Senate lawmakers to reach agreement last month on a plan for reducing the federal deficit by $1.5 trillion over 10 years. The Congressional Budget Office estimated in September that cuts to non-defense discretionary spending, the category which includes NASA, would amount to 7.8 percent in 2013. The prospect of such deep, across-the-board spending cuts have prompted some lawmakers to call for altering the way sequestration is meted out. President Barack Obama, in a bid to keep the pressure on Congress to reach a deficit reduction deal, has vowed to veto any legislative attempts to roll back the automatic cuts. At the same time, Obama administration officials have said the president will ignore sequestration levels when he submits his 2013 budget request to Congress in February. Should the White House and Congress fail to head off sequestration, the automatic cuts would take effect Jan. 2, 2013, biting into NASA's budget at a time when the agency will be working to finish the overbudget James Webb Space Telescope, and to build the heavy-lift Space Launch System (SLS) and the Multi-Purpose Crew Vehicle (MPCV), the flight hardware to support NASA's next manned exploration missions beyond Earth orbit. NASA now estimates that the James Webb Space Telescope will cost $8.8 billion to build and to operate for five years, and that it will not launch until 2018. In 2010, an independent review of the project estimated that the telescope would cost $6.5 billion and launch no sooner than 2015. Meanwhile, the congressionally mandated SLS rocket got $1.86 billion in the 2012 budget. Its companion crew capsule, MPCV, got $1.2 billion. The system is slated to fly an unmanned mission in 2017, followed by a crewed mission in 2021. Both flights are to use a 70 metric-ton variant of SLS to send MPCV around the Moon and back. NASA is now racing to fill a gap in its human spaceflight capabilities. It currently pays the Russian space agency to transport astronauts to the international space station. By 2016, NASA had hoped to turn that business over to U.S. companies that are developing privately operated astronaut taxi systems with financial assistance from the agency. However, NASA officials have said that a 2012 appropriation of $406 million for its Commercial Crew Program is insufficient to meet the 2016 goal.